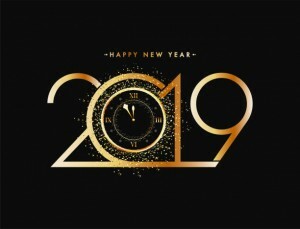 Greetings Loyal Airmen, after a rather slow production end to last year, we’re happy to see 2019 kicking off to a good start. We released our first title last year and now here’s comes a second in one month. 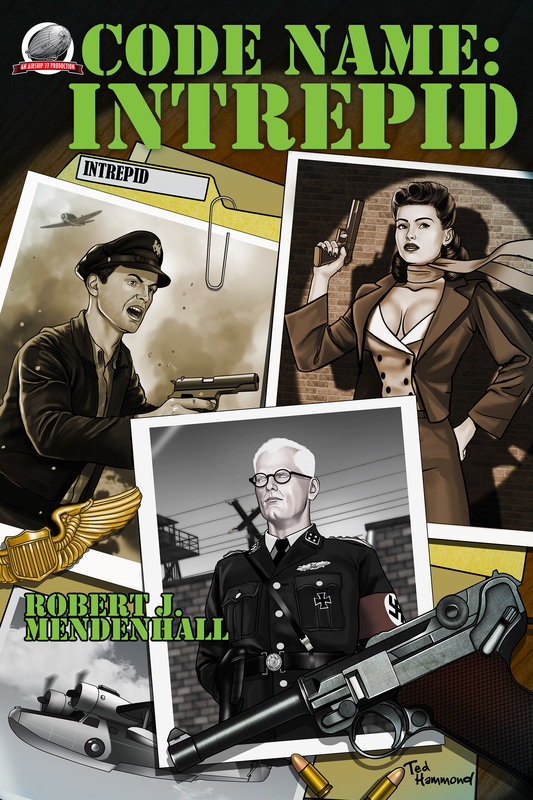 CODENAME – INTREPID is by writer Robert Mendenhall, and features five stories of an elite military unit created by the President in the 1930s to combat all manner of weird threats to the USA. 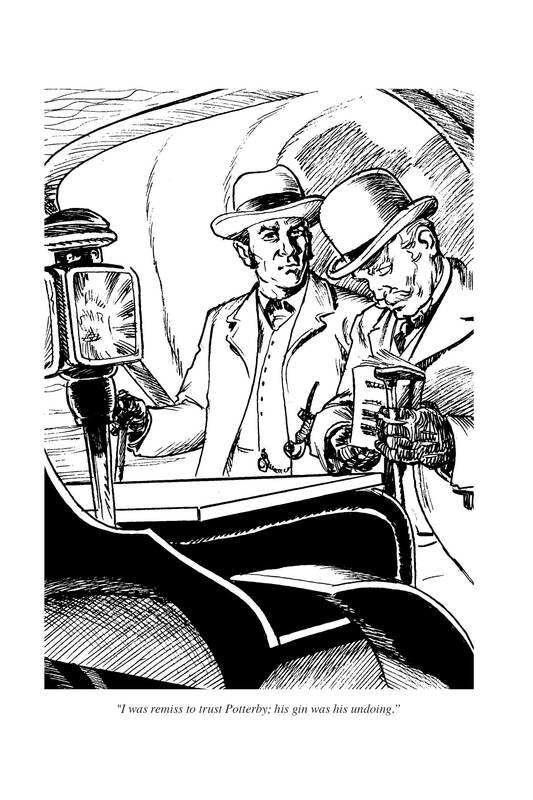 James Lyle provides the interior illustrations and Ted Hammond the gorgeous cover above, which we love. As ever, available now at Amazon in paperback and soon on Kindle. Meanwhile the class comic progresses nicely. 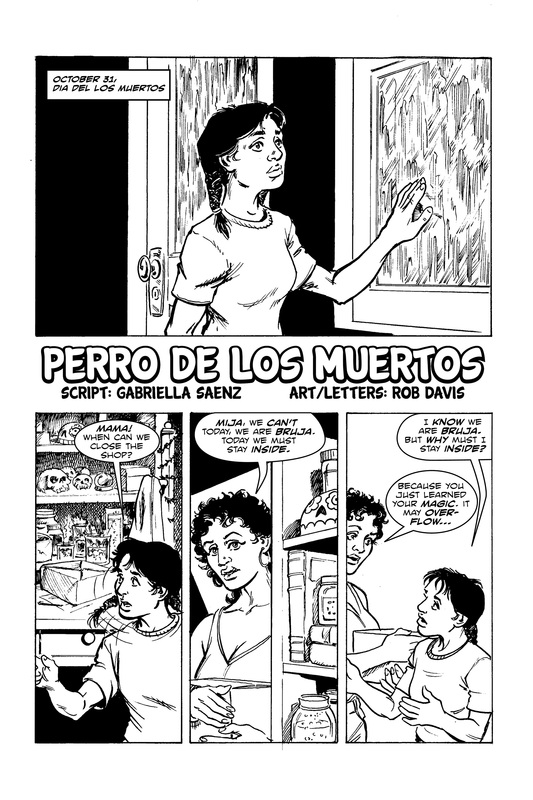 Here’s more from artist Luis Rivera on Justin Green’s tale. We only need the rest of this strip and two more to come in and issue three of FRONT RANGE TALES will be ready to put together and publish. As ever, we’ll keep you posted. We’re sure you’ll recall in our last update we mentioned that our computer had gone on the fritz and had to been sent out to be repaired. Happily it was still under warranty. Valerie was kind enough to let use your laptop but it still was a chore working around certain things all week long. Happily my PC is fixed and we picked it up this afternoon and the Air Chief is VERY happy to have it back and be working at our normal station. Lots of things to catch up on. And there we have it for this week Loyal Airmen, as ever, thanks for dropping by. Ron – Over & Out! 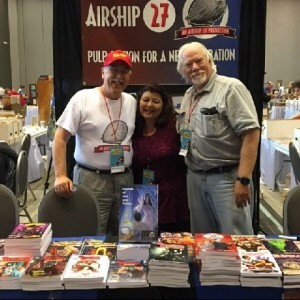 Greetings Loyal Airmen, we’ve got some exciting news as we’ve just released our first Airship 27 Productions pulp title of 2019! Company of Shadows by Wayne Carey tells the story of Frank Blaine, a high school science teacher, who along with his teenage son, enjoys participating in Civil War re-enactments. While in Virginia for one such even, Frank begins to see the ghosts of actual soldiers who fought in that place. They are haunting him to reveal a secret buried for over a hundred years. Company of Shadows is a terrific read, with interior illustrations by Ed Catto and a gripping cover by Laura Givens. Now available from Amazon in both paperback and on Kindle. As ever, Loyal Airmen, thanks so much for your support. On the comic book front, artist Cesar Feliciano has finished doing layouts for all 40 pgs ofr JIN & TONIK Chapter One, the mega graphic novel we are doing together. 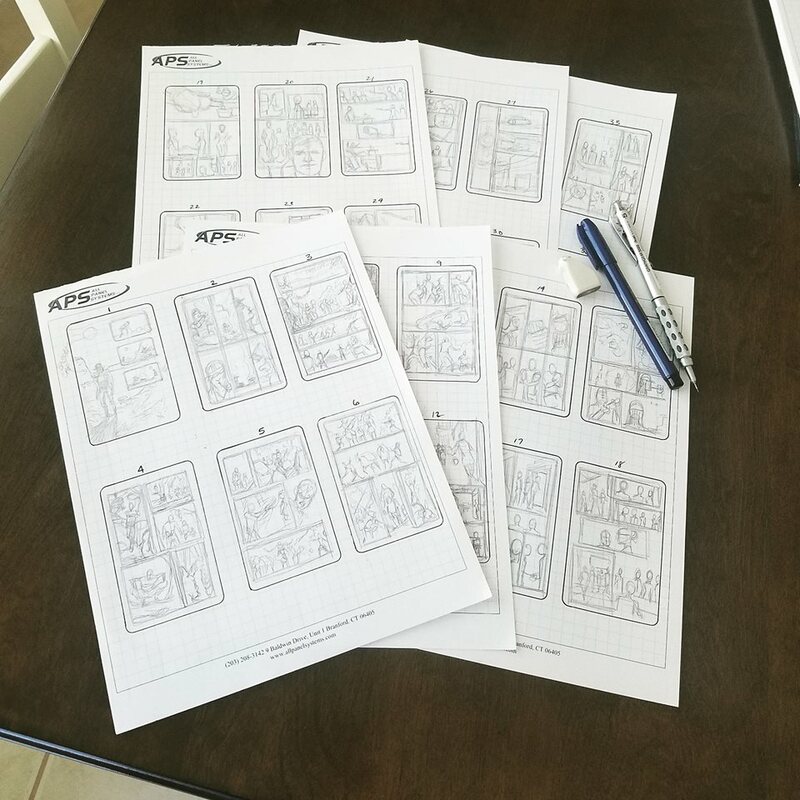 These are the first steps in producing pages. He lays out small thumbnails of each page, how panels to each and very loose sketching in each. Next step, the penciling of the actual pages. 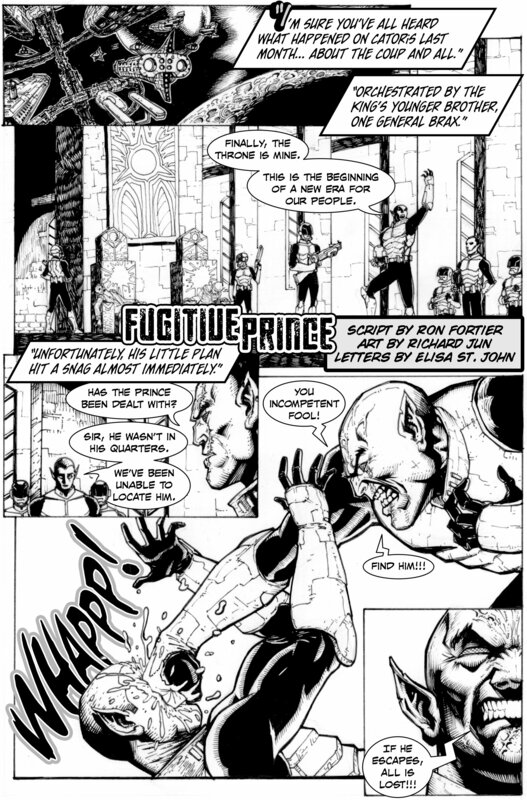 Next we have the new Captain Jain Marlee strip, “The Fugitive Prince” as illustrated by Richard Jun. 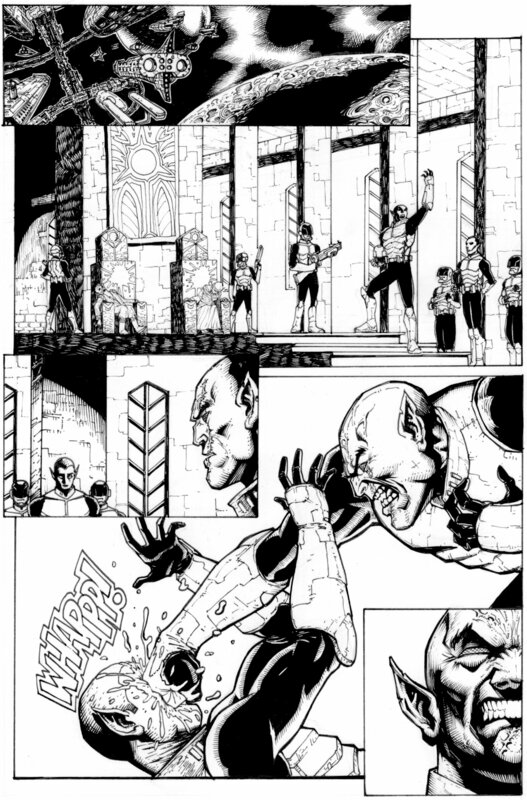 8 pgs of old fashion sci-fi action, now being lettered by the amazin Elisa St. John. As you can see, Ye Old Air Chief is keeping busy with all this fun stuff. 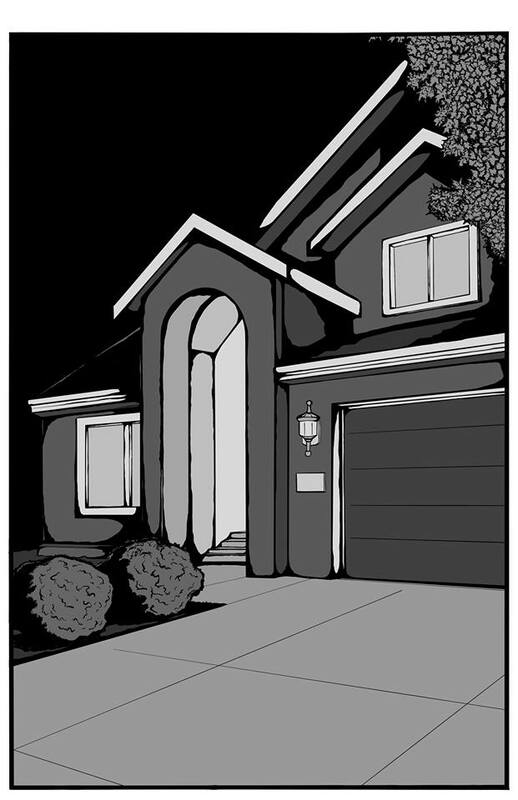 And the new class comic FRONT RANGE TALES is coming along nicely. Here’s the first page of student Evan Hundhausen’s “One Last Favor for Snooky” as illustrated by our pal, Gary Kato. This is shaping up to a really great issue. And three you have it for this week, Loyal Airmen. As ever thanks for stopping by and we’ll meet you back here next week. It always amazes me how much we all rely on computers today. In one lifetime, the world has be come so dependent on these machines that when they do break down, as all machines do every now and then, we’ seem to suffer beyond reason. And the Air Chief finds himself in sad state of affairs as our own PC crashed last week and is now out being repaired. Leaving us to do our best with Valerie’s laptop. Thank God we had. Okay, enough whining, on to this week’s Flight Log. You’ll recall how last week we gave you Loyal Airmen a peek at some of the titles on the way to include SHERLOCK HOLMES – Consulting Detective Vol 13 and how artist Michael Youngblood’s cover would be an homage to the late Sydney Paget. Well take a look at that very cover now in progress above. Michael is doing a fantastic job. Fingers crossed once he wraps it up, the actually book should be out a few days later. 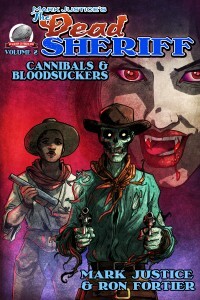 Now for the latest on the newest comic edition of FRONT RANGE TALES. 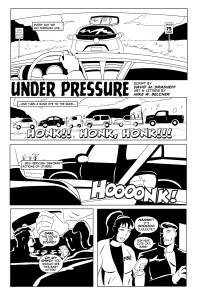 This is the comic the Air Chief puts together using scripts from his How to Write Comics class at the local community college. 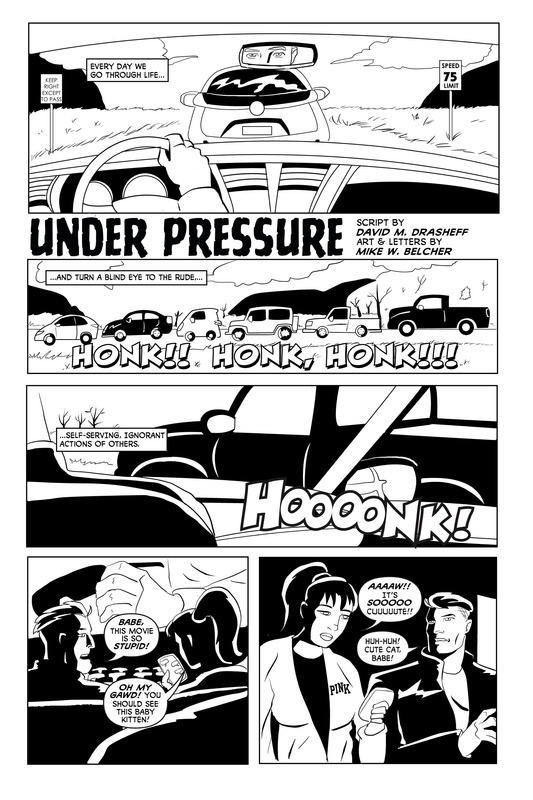 This past week artist Mike Belcher turned in the finished pages for student David Drasheff story “Under Pressure.” As ever Mike did a great job. See page one above. 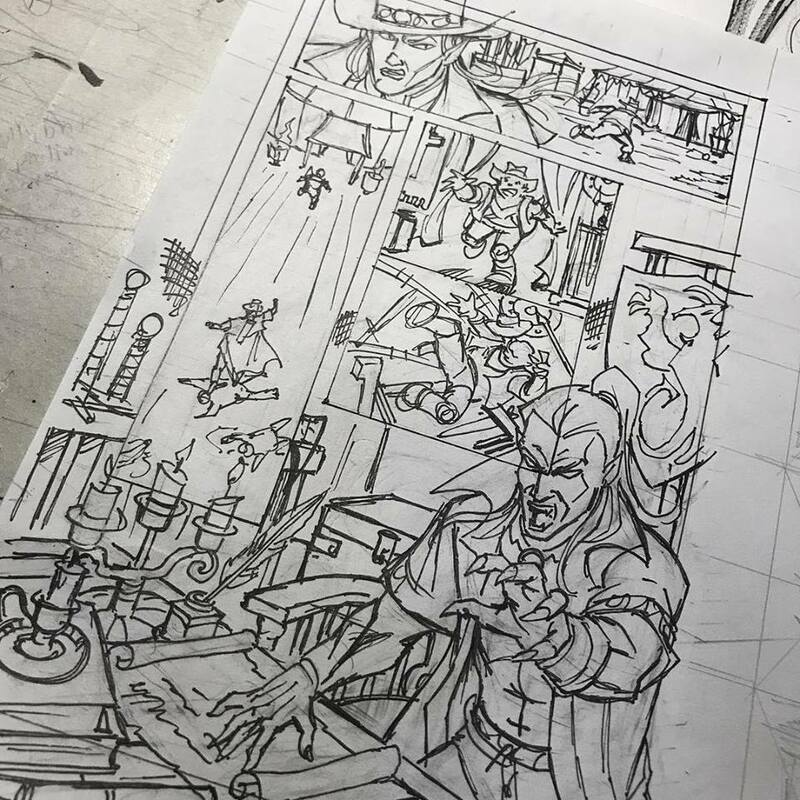 Then a few days ago artist Luis Rivera send along this rough composition of the story he’s drawing for us based on Josh Green’s story. It’s going to be amazing. With fingers crossed we should have the book out in mid Feb.
And that’s our news for this week Loyal Airmen. 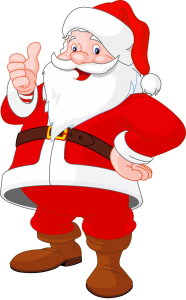 Hopefully next week we will be announcing our firs title release of the year. Talk to you then. Greetings Loyal Airmen, as most of you know, last year Airship 27 Productions released 19 books. Not our most productive year, but then again fairly average for what Rob Davis and the Air Chief are use to. As ever, we were proud of all of these titles and our philosophy of publishing will always be quality over quantity. Whereas rolling over into 2019, we suddenly found ourselves flooded with several amazing projects all nearing production within a week or two of each other. We thought you’d all appreciate sneak-peeks at what is coming so here we go. CODENAME – INTREPID is a new action thriller by Robert J. Mendenhall that introduces the Intrepid Team; a group of military specialist working for the Pentagon in the early 1930s. 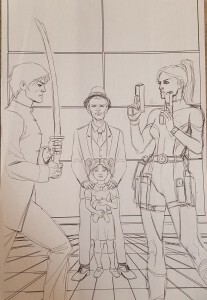 This first book contains their first five adventures. The interior illustrations (ala the one above) are all by artist James Lyle and Canadian Ted Hammond has provided the gorgeous cover. The book is currently being proof-read. 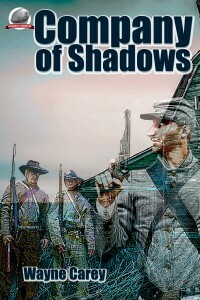 COMPANY OF SHADOWS is a novel by Wayne Carey. A group of Civil War re-enactors encounters actual Confederate ghosts while on a weekend at an historic battlefield in Virginia. Interiors illustrations (as the one above) are by Ed Catto and Laura Givens has turned in her beautiful cover. This one is also being proof-read as we pen these words. 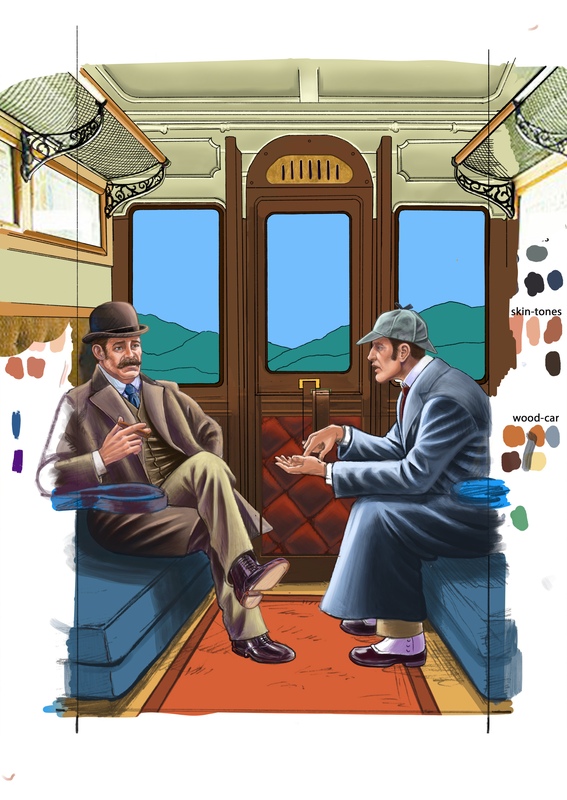 SHERLOCK HOLMES – Consulting Detective Vol 13. The newest in our bestselling series of brand new Sherlock Holmes & Dr. Watson adventures. This volume will contain 5 new mysteries. 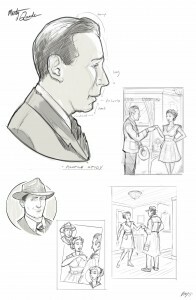 As ever Art Director Rob Davis handles all the interior illustrations (see above) whereas the cover to this book is going to be something truly unique. 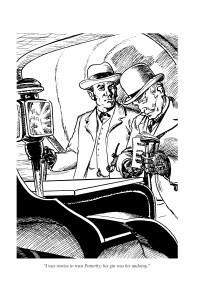 Sydney Paget was the British artist who drew most of the illustrations that accompanied the original tales by Sir Arthur Conan Doyle when they appeared in The Strand Magazine, thus forever guaranteeing his legend as THE Sherlock Holmes artist. A title we like to think has now been earned by Rob, considering he’s done well over 150 Holmes pieces via the Consulting Detective series. 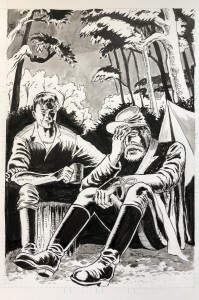 Now over the years, many of Paget’s pieces have been reproduced multiple times and many have become quite recognizable. So the Air Chief, with Rob’s blessing, had the idea of taking one of those Paget illustrations and assigning artist Michael Youngblood to make it the basis for a new cover. At present, while this book is also being proof-read, Michael is hard at work on this cover. 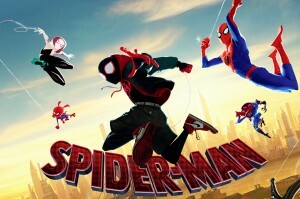 We can’t wait to see it. Ever since my cataract surgery corrected our eyesight, we’ve been aware that all the photos of the Air Chief on-line were old ones taken with our glasses. Realizing that fact, we took this new on, donning the western hat we picked up Mount Rushmore several years ago. 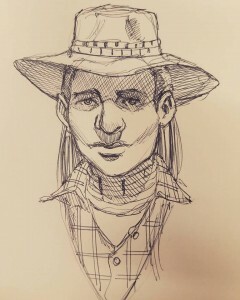 Lots of living lines on that face, heh? And there you have this week’s Flight Log, Loyal Airmen. As ever thanks for stopping by and we’ll see you here next Friday. 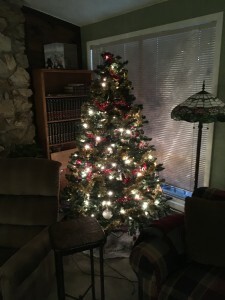 Greetings Loyal Airmen and welcome to our first blog of 2019. Kind of hard to believe just how fast the years are rolling past us. 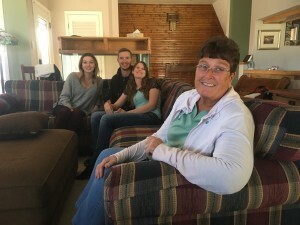 The Air Chief’s mom, who herself is now 94, would always tells growing up that time would accelerate as we got older and now we’re realizing she was all too right. But still, no matter its speed, life continues to bring with it new challenges, wonders and above all else adventures. 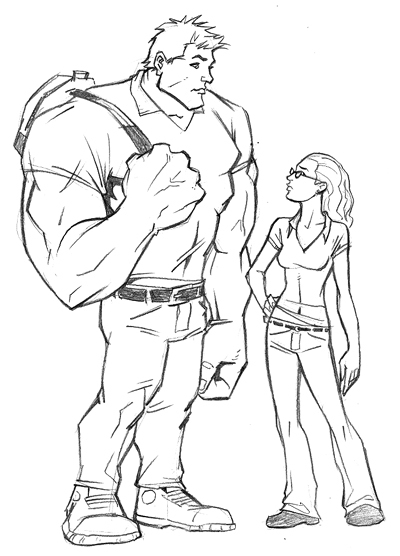 One of these being a new comic book project the Air Chief is working on: JIN & TONIK. The story is about two of the world’s deadliest assassins, Sammy Jin Zhu and Darya Tonikova. 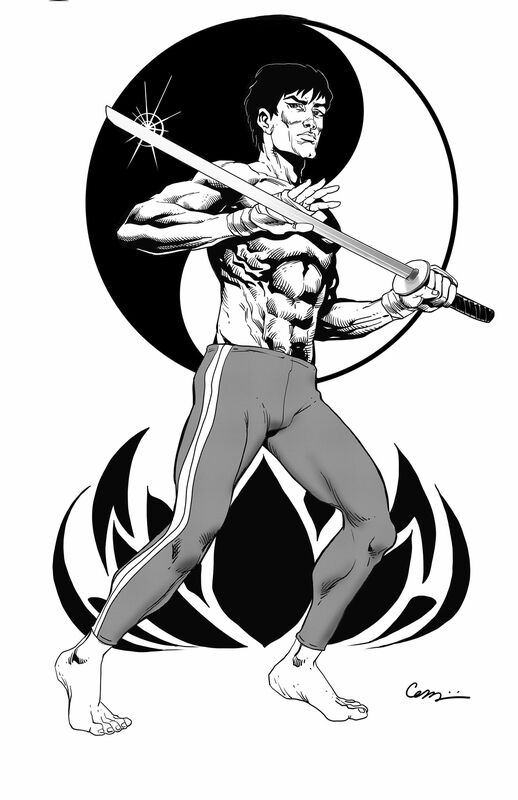 The idea itself was hatched by a truly amazing artist, Cesar Feliciano. Now Cesar and the Air Chief never worked together but were all too aware of each other on social networks. Thus when Cesar came to us last year asking if we liked to work on this idea with him, we didn’t take two seconds to reply “YES!” he is an incredible creator and when he told us the general plot and described the two main characters, we were totally hooked. 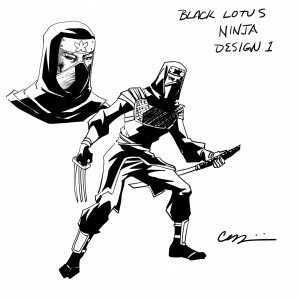 To date Cesar has begun some preliminary sketches, both in pencil only and others he has completed to full inks. 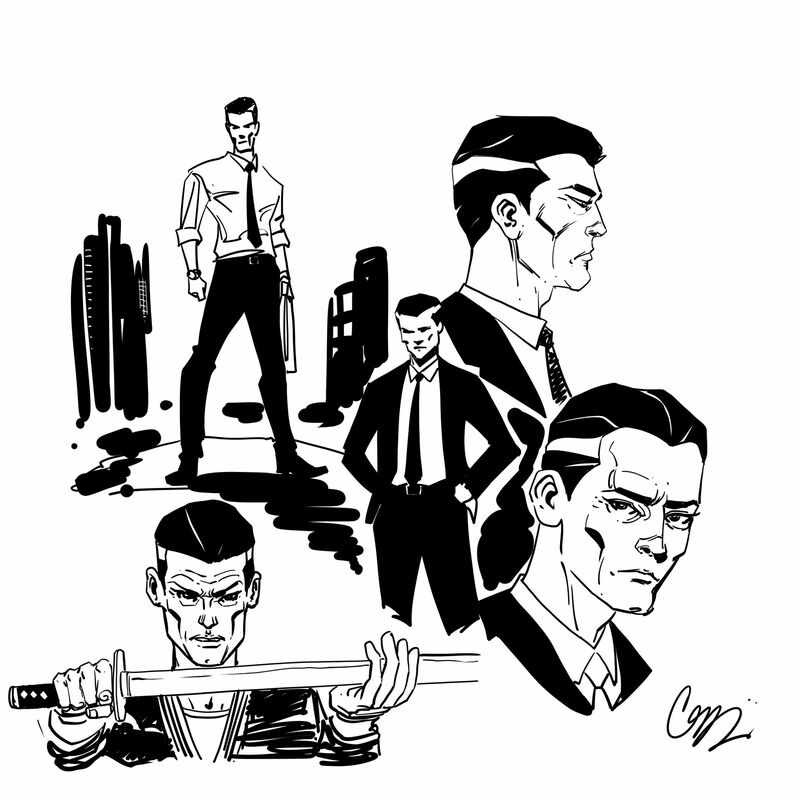 He’s trying to find a specific style that will suit this spy-assassin thriller. Obviously it is clear to see, Darya has quickly become one of his favorites. Meanwhile the Air Chief has completed chapter one and is hard at work on chapter two. Once we have an issue ready ready to go, we will most likely be seeking funding via one of the many programs available to us on-line. The Air Chief is leaving that to Cesar. Hopefully we’ll be able to offer all you Loyal Airmen something truly special and different enough for you to want to support our efforts. We’re still a ways away from that point, but it is never too early to start the Promotion Machine. Thus this blog and all these amazing pieces. Enjoy. We’ll certainly keep you posted. On reflection, it has been a long time since this Air Chief has been this excited about a comic project. Guess we’re still got some stories to tell. 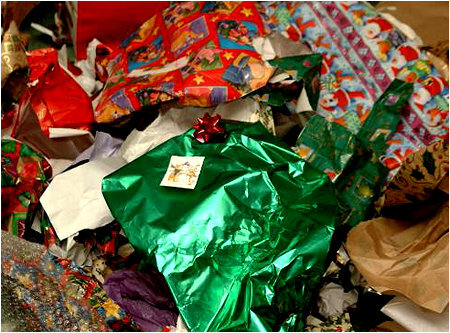 Greetings Loyal Airmen, as you are reading these words, another Christmas has come and gone. Just like that. 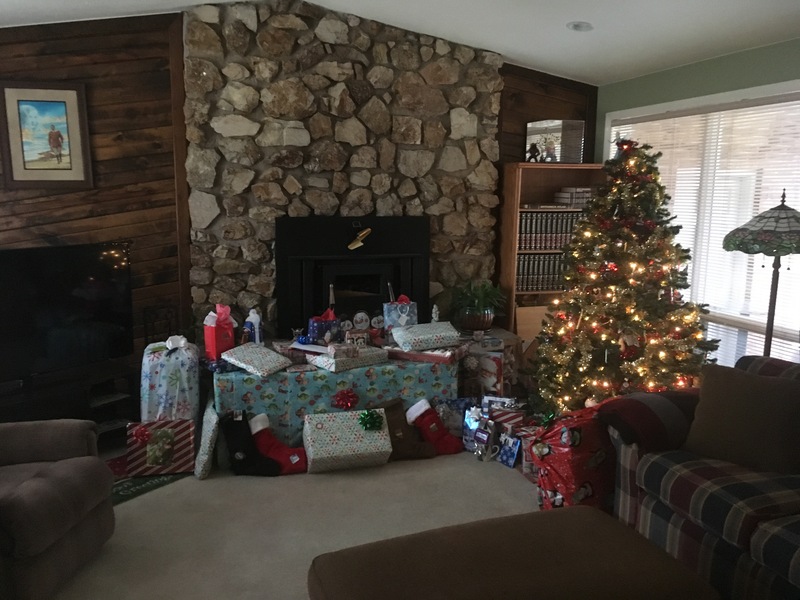 Now the gifts have all been unwrapped, the guests from out of town packed up and gone home, and Mom & Dad can actually kick back and relax for a little while before the cleaning needs to get done. The Air Chief and Valerie truly hope all of you had a fantastic Christmas. Ours was just amazing. 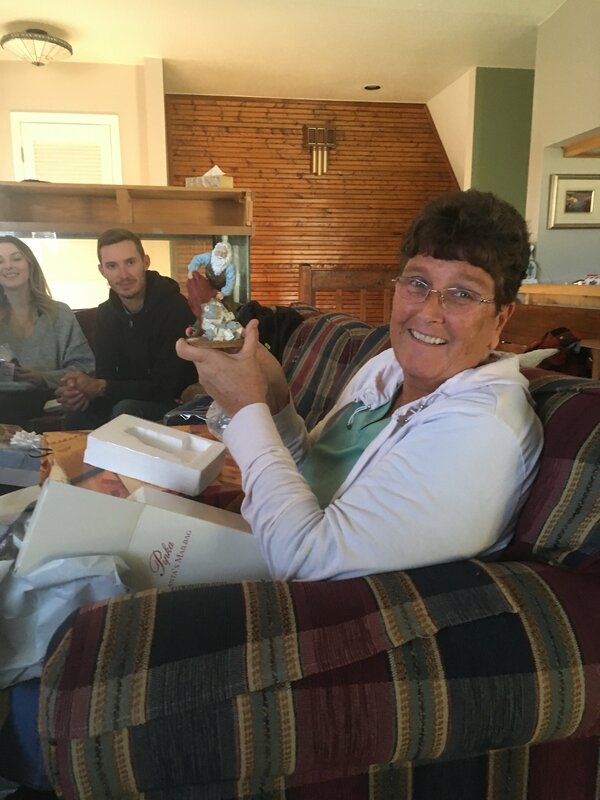 So much fun to be with our loved ones again, while knowing those who have left us had to be smiling down from heaven. 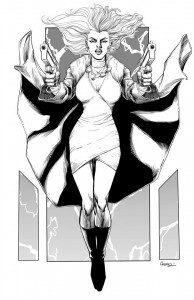 The Air Chief has promised to get the book out before year’s end and thanks to artists Zachary Brunner (cover) and Art Cooper (interiors) and part Rob Davis on book designs, we fulfilled that goal. The book is now available on Amazon in both paperback and on Kindle. And to Mark, whose spirit guided us all the way, thanks. Now onto our family Christmas fun. 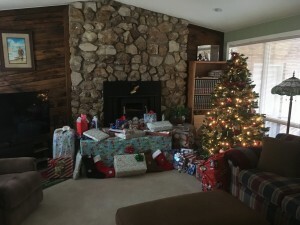 By Christmas morning, Santa’s surprises were packed by the tree and fireplace. Valerie set out some really awesome breakfast treats as we awaited the younger members of the clan to show up. Both our grand kids, Cora and Alex, has spent Christmas Eve with their respective significant others. By one in the afternoon everyone was finally gathered, coffee poured and it was time to start digging into those brightly wrapped packages. 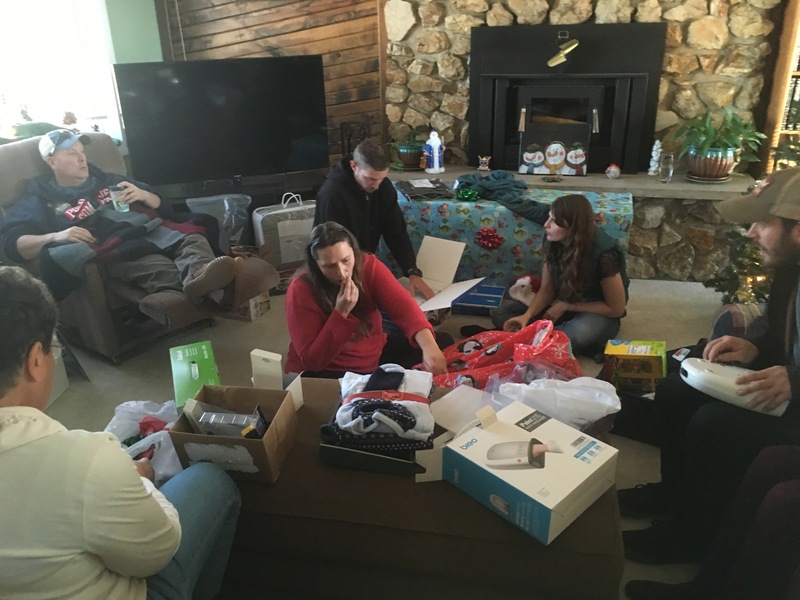 That’s Alan in the recliner, Valerie in foreground, Nicole at center, with Calvin and Cora behind her. While the Air Chief began snapping pictures. In left, Val again in foreground, behind her left to right is Alex’s girlfriend Chloe, then Calvin and Cora. To right, Cora modeling her new Pea Jacket with brother Alex and Chloe looking on. 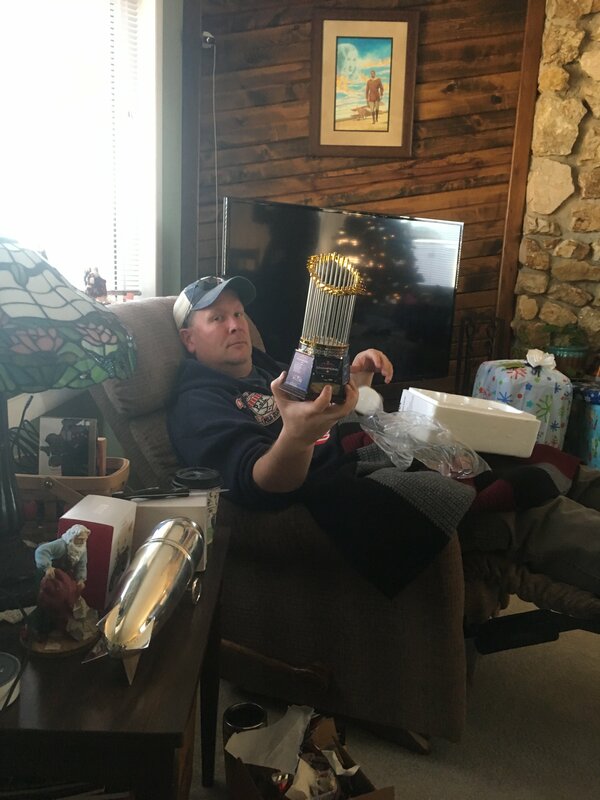 Alan shows off the replica Baseball World Series Trophy showing the Red Sox as 2018 Champions, while Val was really surprised to find she had a brand new Pipka Old World Santa to add to her growing collection. 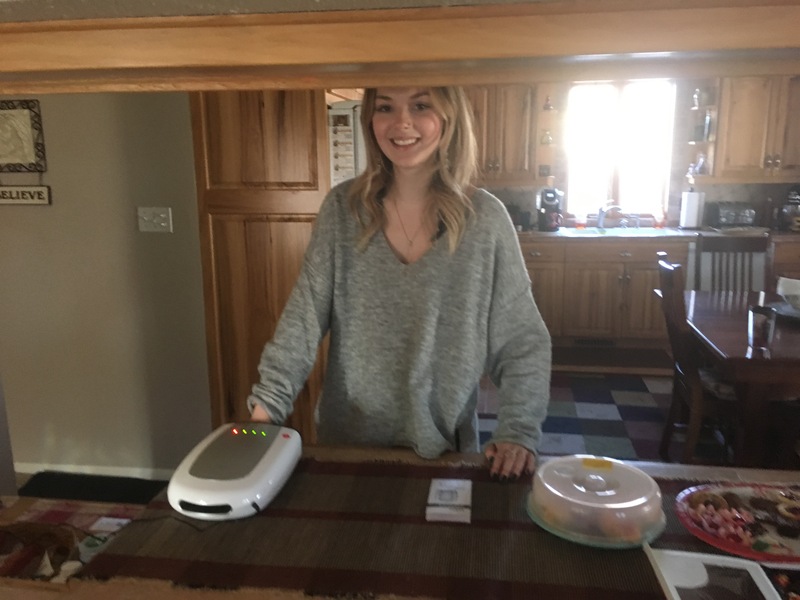 Chloe was really happy with her new electric hand massage machine and Alex had the biggest gift, his gun case. 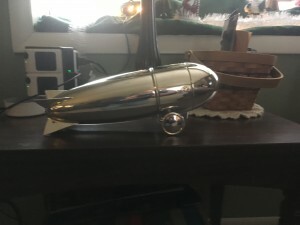 And the Air Chief was delighted with this replica of a 1930s cocktail shaker shaped like an airship. The originals appeared soon after the first giant Zeppelins came out of German factories. 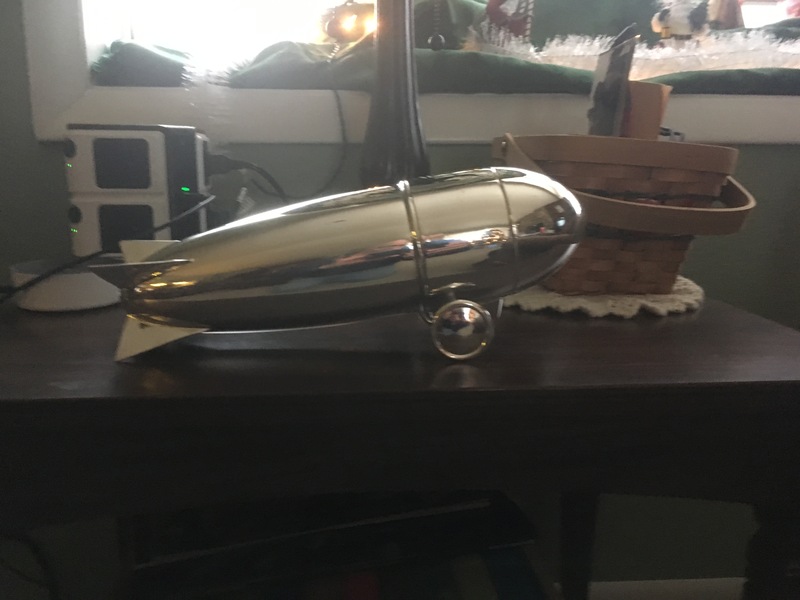 Soon air ships were the craze around the globe and this snazzy mixer soon appeared in all the fancy metropolitan bar scenes. We love it. And there you have it Loyal Airmen, our last Flight Log of 2018. We want to end this one with wishing all of you a truly awesome, amazing, wonderful new year. 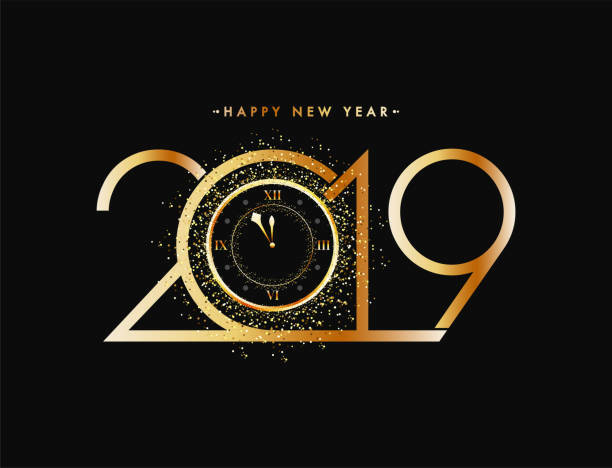 Let’s make 2019 the best one of all. Ron – Over & Out!! 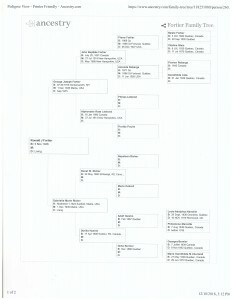 Those of you Loyal Airmen who follow this strip on a regular basis are aware that the Air Chief has an interest in genealogy. 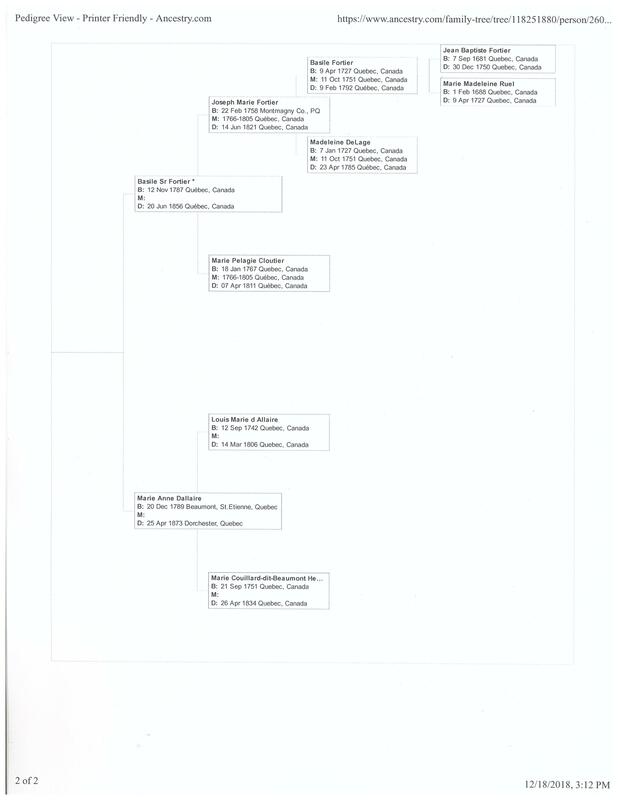 Leaning about one’s family history is always fascinating. 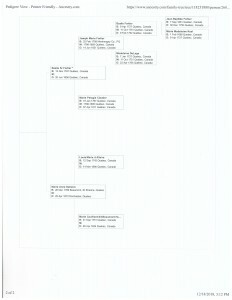 Recently a friend on Ancestry.com offered to trace hour line with the information the Air Chief provided him. 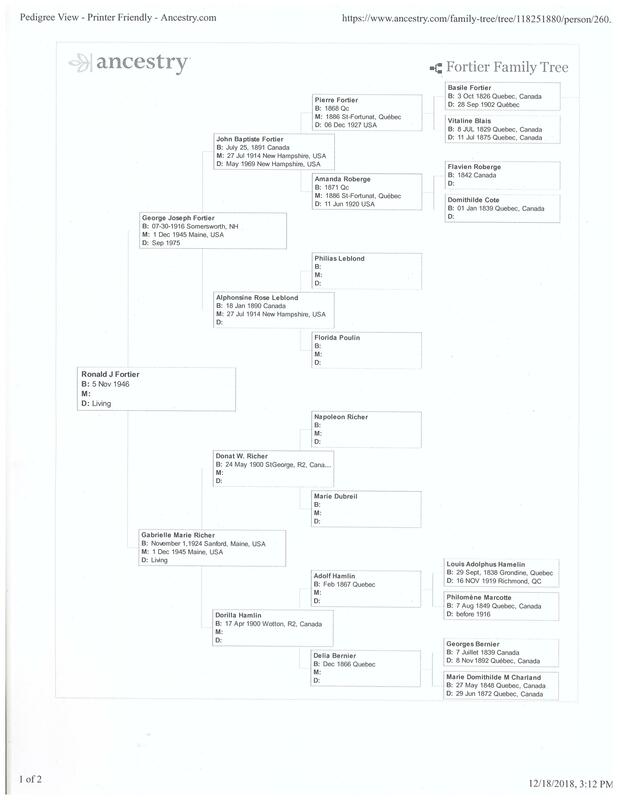 Above, going from left to right, and starting with our name, we were able trace our ancestry all the way back to 1681 and the birth of one Jean Baptiste Fortier. 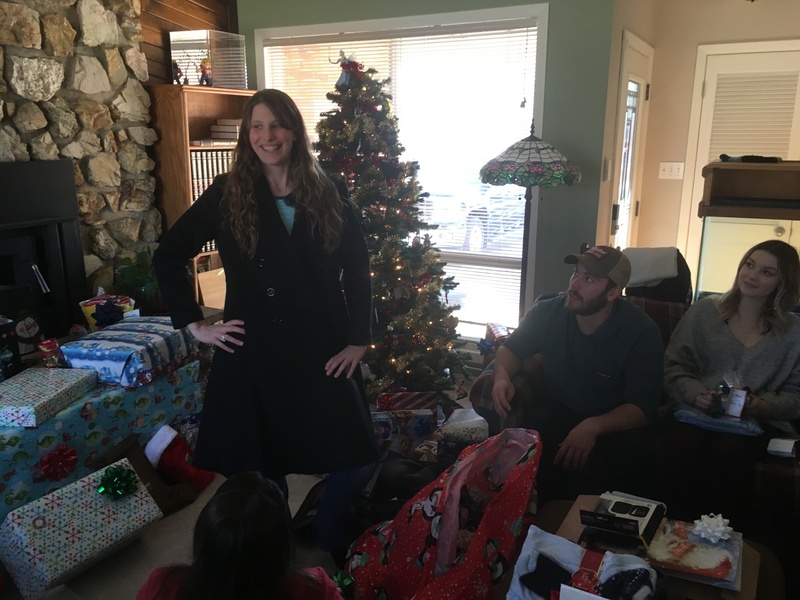 As it turns out that was the exact same name as our won grandfather, so passing along names seems to have been a tradition. Now we also know that the Fortiers came to Quebec in the early 1640s from France. Originally the name had been Fortiter and somewhere along the time was altered. Antoine Fortier was the French pioneer who moved to Canada is most likely Jean Baptiste’s father. 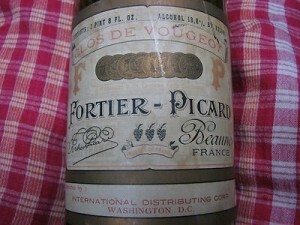 Which then explains the our family coat of arms, which we’ve posted here in the past, and that led to the Air Chief find the Fortier-Picard vineyards still in operation today. Truly fantastic stuff on all our amazing ancestors. And finally, with Christmas only three days away now, we want to wish all you Loyal Airmen, and your loved ones a truly joyous MERRY CHRISTMAS. 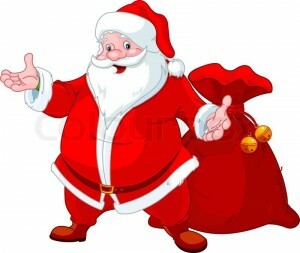 Here’s hoping Santa Clause grants all your Christmas wishes. 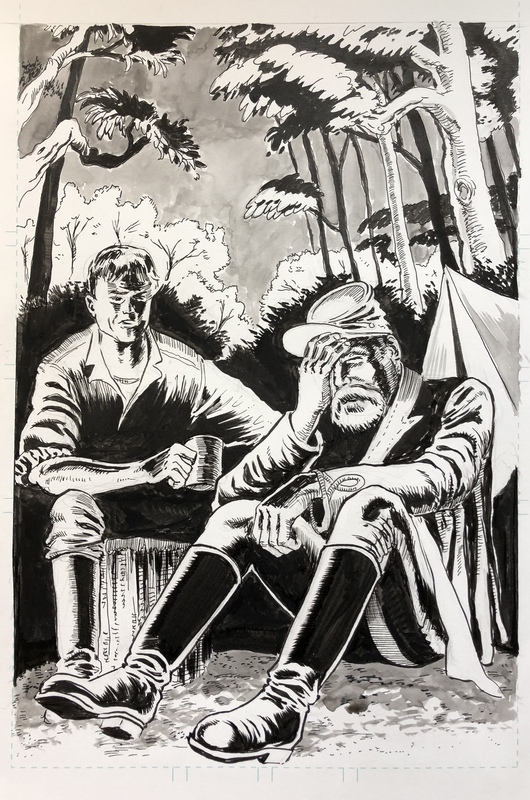 Greetings Loyal, Airmen, as you all know, one of the things we loved doing with Airship 27 Productions is bringing back long forgotten pulp characters. 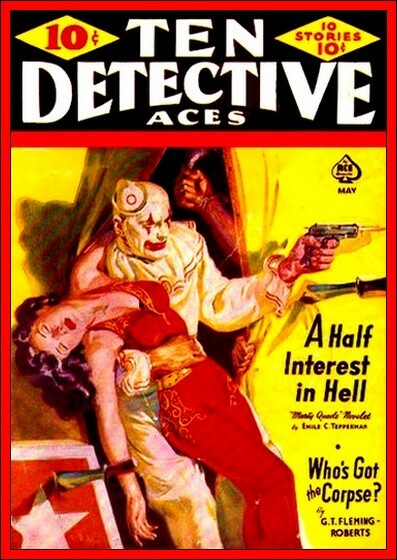 Several years ago we challenged our writing colleague, Chris Bell, to find us an actual pulp private eye who had appeared in pulp magazines that we could bring back. 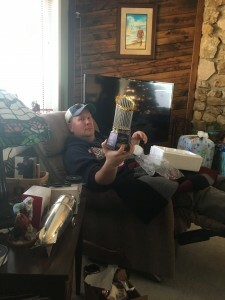 After six months of searching, Chris found Marty Quade. Quade had appeared in the popular Ten Detective Aces magazine and his stories were straight up crime tales. 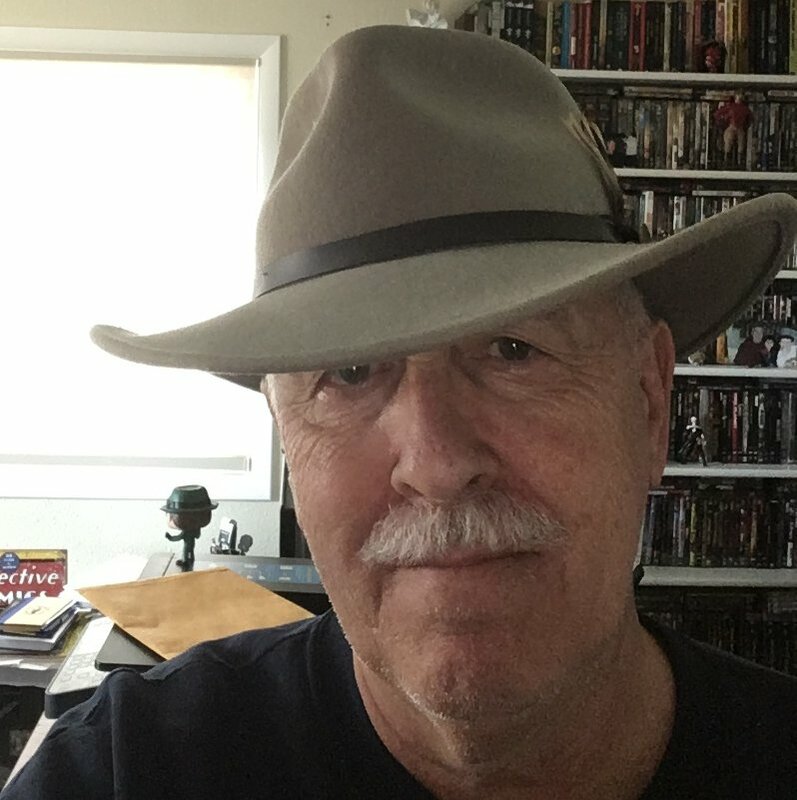 After reading several of these, Chris made up a bible and we recruited four of our regular writers to whip up four brand new Marty Quade tales. 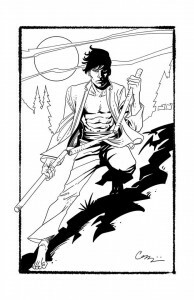 The next challenge was finding an artist to do illustrate these stories. As it would turn out, the Air Chief all but tripped over Brian Loner at our comic shop a few years back during Free Comic Book Day. Although he has his own lucrative business, Brian loves the draw and ultimately we gave him the assignment of illustrating the first ever new Marty Quade collection. Above to the right are some of his early sketches. And here is one of Brian’s completed spot illos. There will be a total of 12 in the completed book. With those nearly done, it is up to the Air Chief now to get out there and find a cover painter. With fingers crossed this new title will be out early in 2019 and we couldn’t be more excited about that. Now that we are in the Christmas season, the Air Chief is really enjoying everything about the holiday. 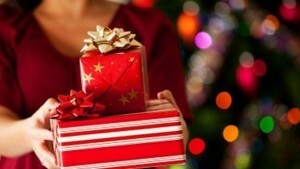 From writing Christmas cards to giving and receiving gifts. Thing is it seems every single year, one or two of our writing colleagues surprises with unexpected gifts of both generosity and thoughtfulness. Such was the case this past weekend when a trip to the Post Office netted the Air Chief a very big package and a very little package, both from wonderful writing pals. The little surprise came from Emily Jahnke. Earlier this year, she and her family took a great trip to New York City and visited all the fun tourist locales that are so plentiful there. 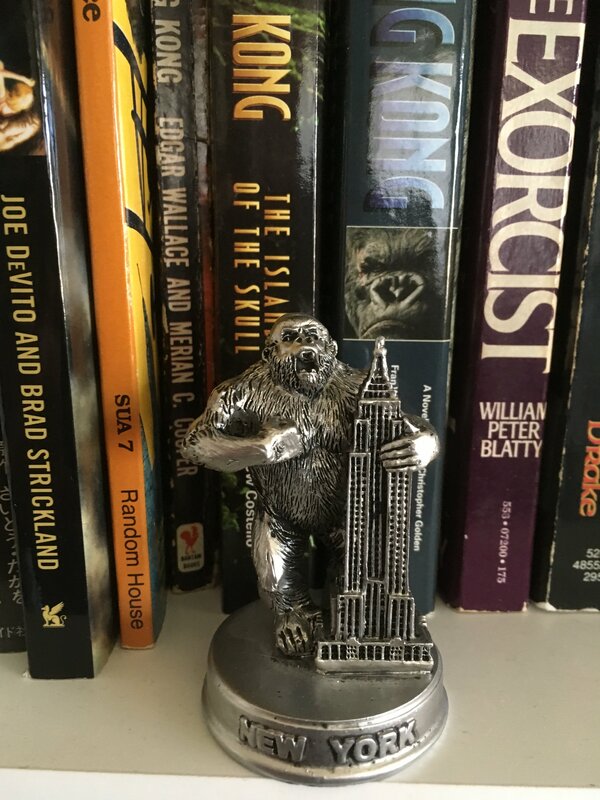 At one point they went to the famous Empire State Building and Emily recalled the Air Chief was an avid fan of the movie King Kong. All of which is gospel, as it remains to this day our favorite. So while passing a gift shop in the building, Emily saw the above little piece and bought it for us. Then she hung on to it all this time so that she could surprise us come Christmas. Emily, you succeeded superbly. 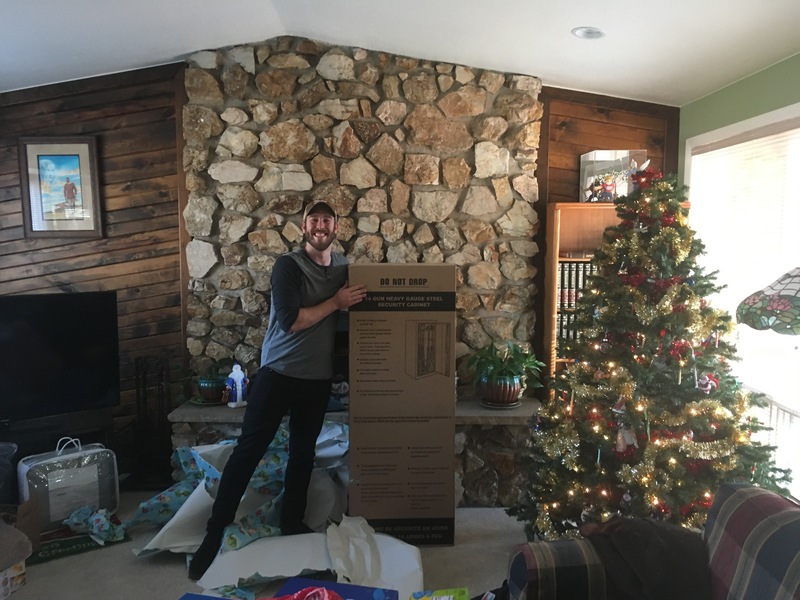 And we wish you could have seen our smile upon opening you box. 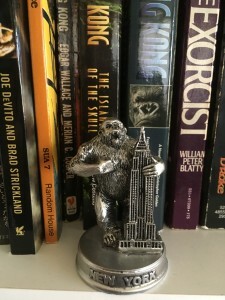 We truly love this new addition to our ever growing collection of King Kong memorabilia. Thank you so much. 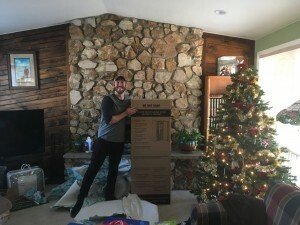 At the same the Postal Clerk was also handing the Air Chief this massive, soundly constructed box that was darn heavy. 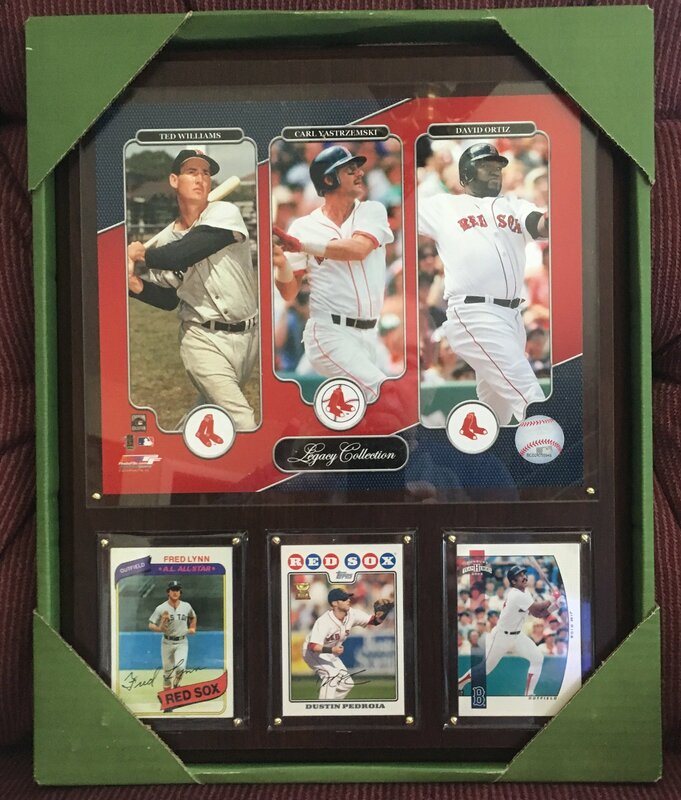 Upon carefully opening it in our office, we beheld this incredible sports plaque featuring six of the greatest Red Sox players to ever take the field. On the top in the large photos are left to right, Ted Williams, Carl Yastrzemski and David Ortiz, while the lower tier were three actually signed baseball cards with Fred Lynn, Dustin Pedroia and Jim Rice. Honestly, our mouth dropped at the sight of it. This coming on the year our beloved Red Sox won their fourth World Series in 15 years. This amazing gift, which will soon go up on our office wall was the gift of Michael and Donna Housel. 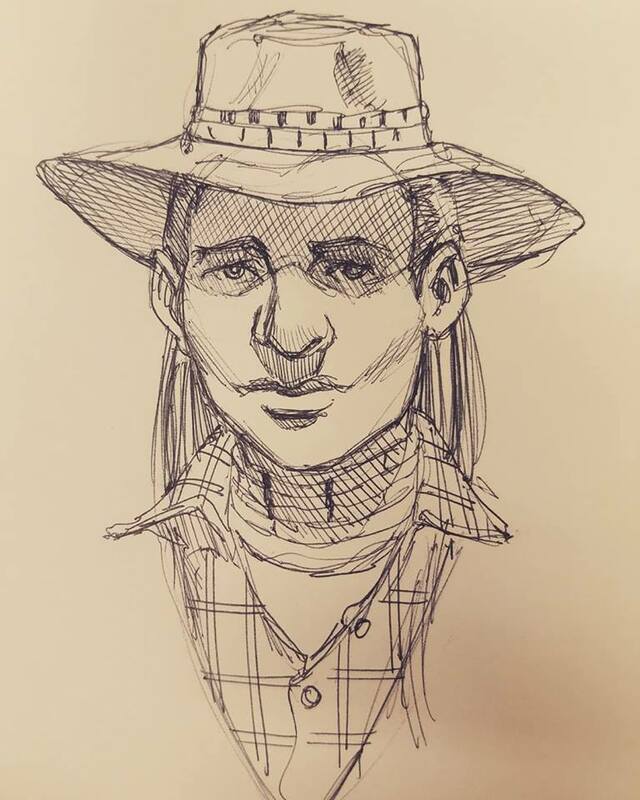 Michael is one of our finest young writers at Airship 27 Productions and you can expect to see a whole lot more of his amazing fiction in the near future. For now, thank you Michael & Emily, from the bottom of the Air Chief’s heart. A Merry Christmas to both of you and your loved ones. Finally we want to end this week’s Flight Log with a few words of hopefully helpful advice. 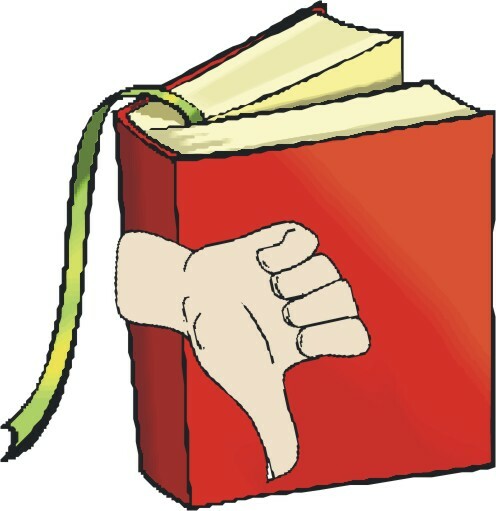 Have you ever started reading a book and found it was simply bad? Then you kept pressing on in hopes that it would eventually somehow get better? The Air Chief does a regular review blog, Pulp Fiction Reviews, and over the course of a year, we normally read and review between 40 and 50 books. Whereas most of them we can generally find something good to mention, even if it isn’t fantastic. Recently were were send a review book and after some twenty pages realized it just wasn’t our cup of literary tea. And yet we persisted for the next two weeks managing to get through the first 104 pages. But the book was still nonredeemable and we finally had to toss it aside. No, we do not write bad reviews. If a book is bad to us, it still may be okay to another reader. We merely choose not to review it. Although the Air Chief wishes we’d just put it down two weeks ago. The great writer James Joyce once said, “Life’s too short to read a bad book.” Amen to that. 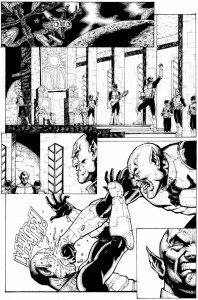 Greetings Loyal Airmen, over the years, as a writer of comics, the Air Chief has come to appreciate more and more the value of what good lettering brings to a comic project. 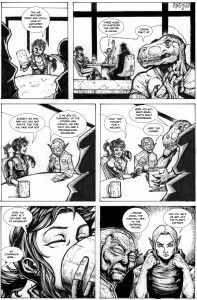 Now finding ourselves teaching comics scripting, that value in our own estimation continues to grow. 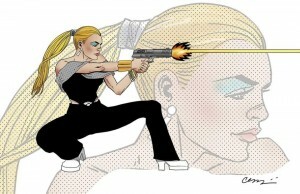 You see, at its core, a comic book is about two sensibilities, tell a story with words (literature) and pictures (art). The two are combined when a letterer reads the writer’s scripts and then taking the artist’s page, adds the captions and word balloons. Above is the first page of our latest Captain Jain Marlee – Space Smuggler – adventure, “Fugitive Prince.” The art is by the amazing Richard Jun. 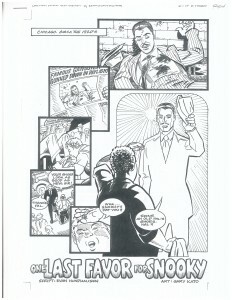 Now on the left above is Richard’s completed artwork based on our script. Lettering the project is a new talent, Ms. Elisa St. John who we met very recently. Elisa loves comics and wants to be a professional letterer. Impressed by her work, we recruited her for this project and above on the left is the same page now with Elisa’s amazing lettering. 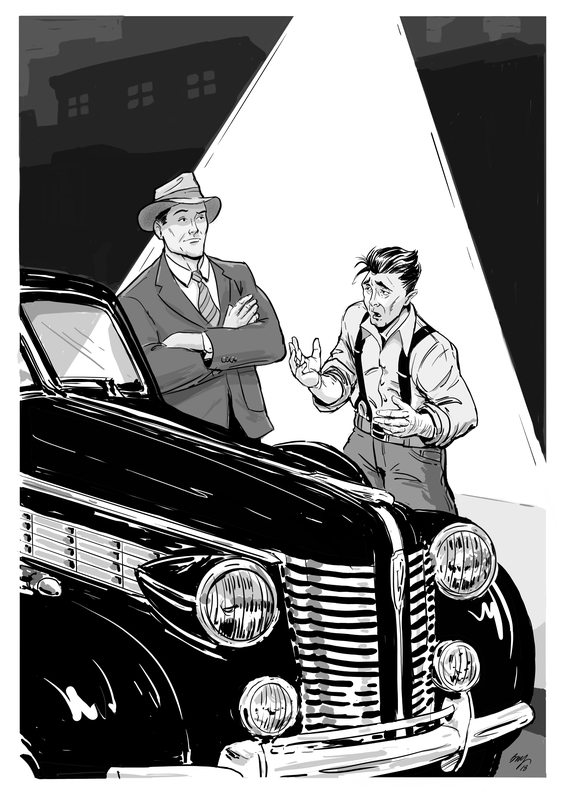 NOW…it is really a comic page. These are the little things we do our best to teach our new writers. Without decent lettering, you’ve got nothing. And speaking of our teaching, back in Nov the Air Chief wrapped up his third such writing class. As ever, we are now putting together a new issue of FRONT RANGE TALES, the comic completely written by our students. 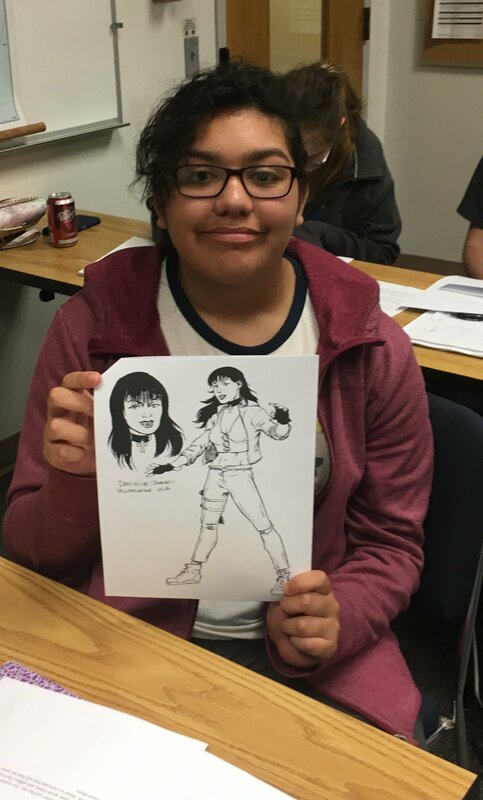 Today artist pal Rob Davis turned in the first page to the story penned by student Gabriella Saenz. At 13, Gabriella is the youngest student we ever had the fun of working with. She is such a talented young lady. With fingers crossed the finished new issue, the largest we’ve ever put together, will be out in early Feb. 2019. Stay tuned. 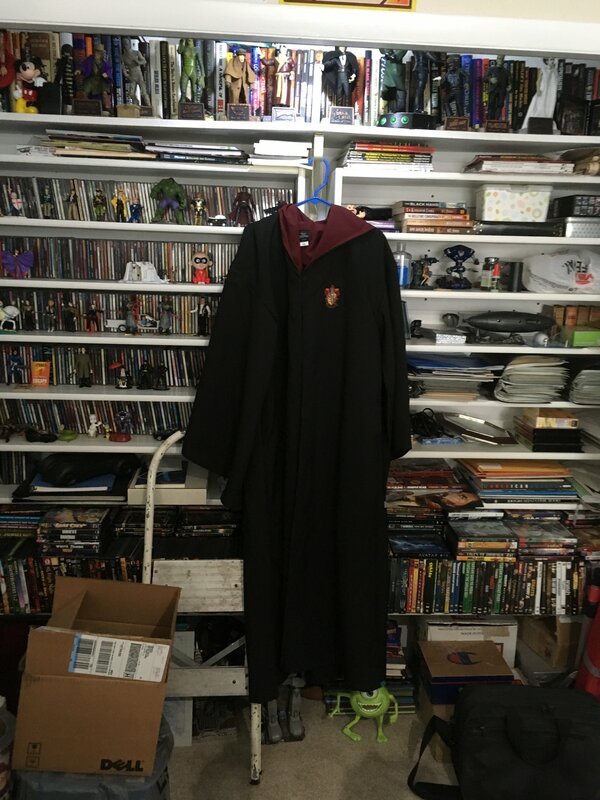 Long…long…ago, our oldest granddaughter, Kristi, started reading the Harry Potter books. It didn’t take her long to us hooked on the series and for series it was something special we shared. We mentioned a few podcast back that in late Oct, the Air Chief and Valerie finally made it down to Harry Potter World in Florida. 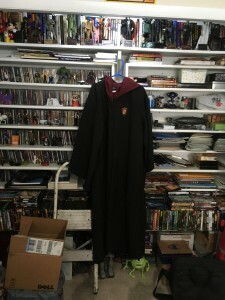 While there the Air Chief spotted these authentic school robes as worn by the students and teachers at Hogworts Wizarding School. And we had to have one. Now it hangs proudly in our office, a reminder of a wonderful series, a loving granddaughter and the magic of the imaginations. And that’s our Flight Log for this week. Hope all you Loyal Airmen are enjoying this wonderful holiday season. See you back here next Friday. 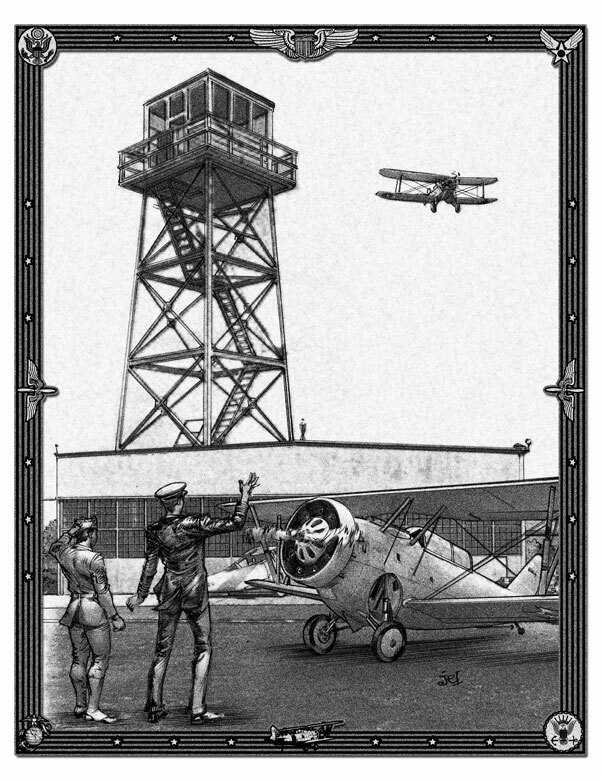 Greeting Loyal Airmen, we’re really excited to let you know our latest pulp title was released last weekend. 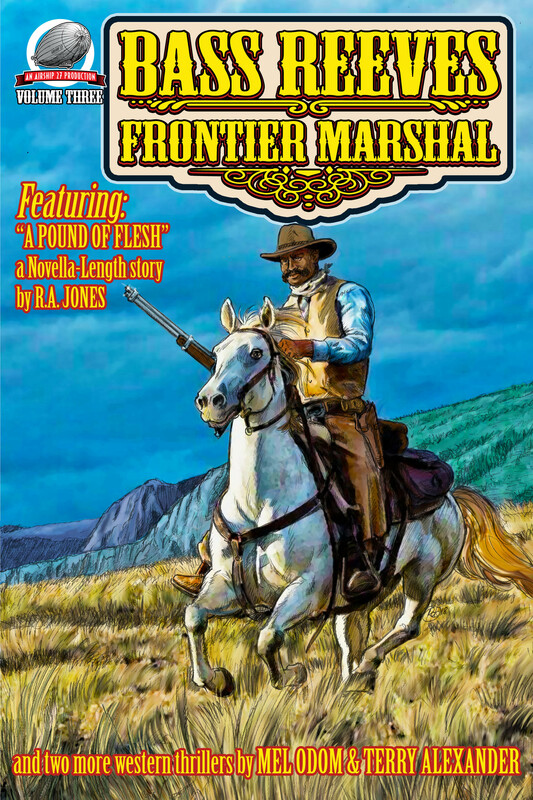 BASS REEVES – Frontier Marshal Vol 3 features a full length novella by R.A. Jones and two other stories by Mel Odom and Terry Alexander. All starring the most famous western lawman of them all, Bass Reeves. Reeves was an actual U.S. Deputy Marshal working under Judge Isaac Parker in the Oklahoma territories before it became a state. Coincidentally, all three writers in this volume are Oklahoman. 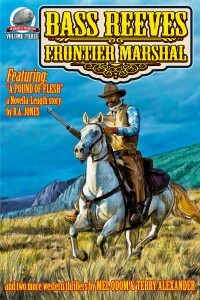 If you like authentic western action adventure, then this is the book for you. As ever available from Amazon in paperback and on Kindle. The cover and all interior illustrations were provided by our own Art Director Rob Davis. We thank you for your support. 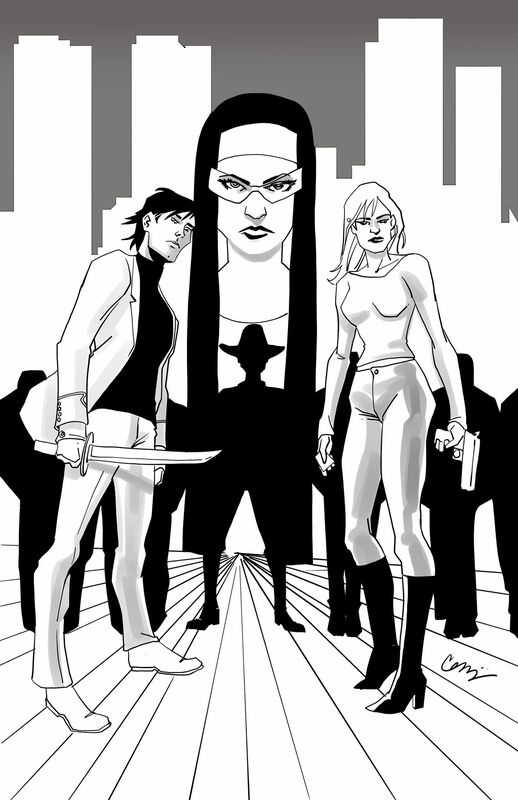 On the comic book front, several projects are moving along rather quickly. 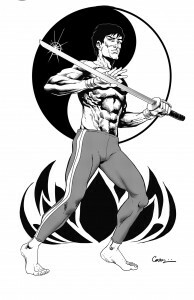 One of these being the new series the Air Chief is currently developing with artist Cesar Felicano, JIN & TONIC. 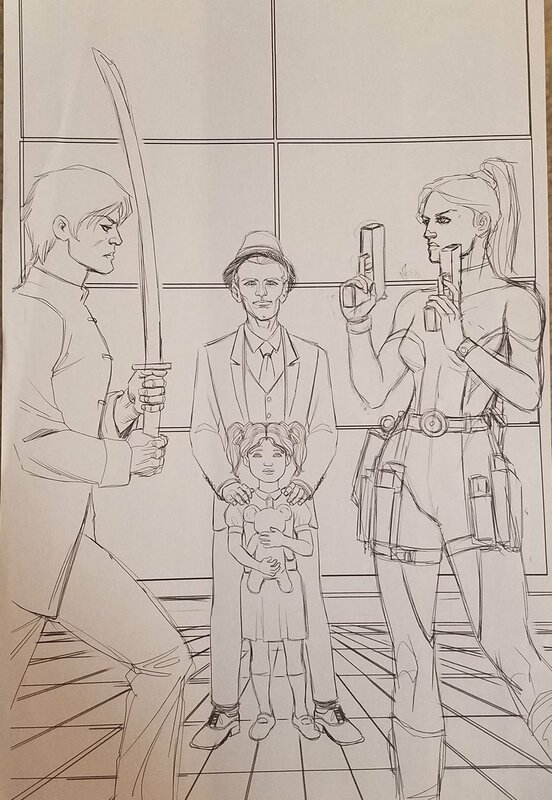 Cesar just turned in the above illustrations of the two principle characters, Sammy Jin, a martial arts experts and Russian born Darya Tonikova, both skilled assassins. This is going to be an incredibly fun series and the Air Chief is just about to start writing the second chapter. We’ll keep you posted. Whereas years ago, the Air Chief created a comic project called BULLDOZER that was never launched…for various reasons. Thus the notes and old artwork sat in our files collecting dust over the past 15 or so years. The image above to the left was one of those original pieces. We honestly don’t ever remember who the artist was that did it. Anyway, we recently dug the folder out of our files and showed it to our young artist pal, Jon Bonjour. Jon loved the entire concept and has signed on to be the artist. 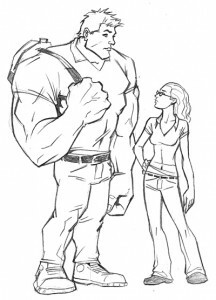 The sketch to the right is his first take on the main character and we love it. 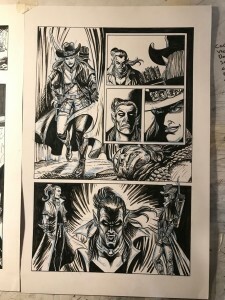 Happily the Air Chief kept a copy of the manuscript for issue # 1 and Jon will soon begin drawing it. Only goes to prove you should never throw away old ideas….ever. And finally, with Thanksgiving behind us, it was time to bring out the Christmas tree. Valerie and granddaughter Cora once again did a great job. Seeing there lit up at night, puts all of us in the holiday spirit. Here’s wishing that same wonderful spirit to all you Loyal Airmen.